Silence, fanboi666. You and your idiotic, vitriolic comment-leaving cohorts will no longer occupy the top spot in the YouTube comment stream, even if you were the last person to post. 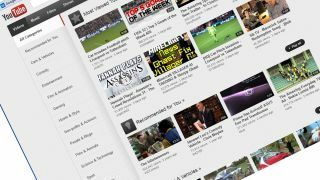 The Google-owned video site announced today that major changes are afoot for the way comments populate and are moderated. "When it comes to conversations happening on YouTube, recent does not necessarily mean relevant," an official blog post read, setting the stage for the updates it plans to roll out fully in the coming months. As everyone from YouTube stars to the occasional viewer knows, the site's comment sections can be a cesspools of racist, homophobic, sexist and down-right mean content. Posts are currently organized with the most recent at the top, so no matter what's said, the last-left comment will appear just below the video information section. The changes coming to YouTube aim to turn the whole system on its head. To make sure more relevant content occupies a higher place in the comment totem pole, YouTube is teaming up with Google+. Beginning this week, comments powered by Google+ will appear on channel discussion tabs. The feature will come to all comments as the year progresses. Comments from people in your Google+ Circles will be joined at the top by those from video creators, "popular personalities," and people who are having "engaged discussions about the video." A YouTube spokesperson told us that while there'll be a more personal feel thanks to users seeing people they know or may have heard of, popular conversations, including from random people, will also rank highly. In addition to the rearranged comments, YouTube visitors will have control over how widely their onsite conversations are broadcast. "You can choose to start a conversation so that it is seen by everyone on YouTube and Google+, only people in your Circles or just your bestie," the post read. Replies will be threaded, just like in Gmail. Finally, YouTube is handing content creators the reigns to control comments, giving them new tools to review pre-posted comments, block certain words and enabling auto-approval for certain fans. Now, Google+ has seen a growth spurt, though it's far form the most widely used social network. It stands to reason that those without a Google+ account, and those who don't want one, could feel miffed about being stuck in the current commenting culture, while those who have one see comments with a more personal feel. The solution? Open a Google+ account, of course. We'll see how it shakes out as time goes on and the changes go into effect, but for those concerned about having their real name appear on the site, the same YouTube spokesperson told us that pseudonymity isn't going anywhere. To keep or use a new pseudonym, users can create a new Google+ Page, and connect their YouTube accounts to the Page, the spokesperson said. And if you don't like the new comment arrangement, you can always go back to the chronological way things were. YouTube isn't the only one making comment-related changes today.